More market-rate apartments are being built in downtown St. Petersburg right now than at any point in the city’s history, largely thanks to it’s transformation into a live/work/play environment. Since 2014, roughly 1,800 residential rental units have been built in St. Petersburg, increasing the area’s overall apartment stock by a little over 30 percent. The number of new apartment projects completed over this timeframe have averaged three times the area’s historical trend, and the number of new units under construction relative to existing inventory has never been higher. That breakneck development pace has only accelerated of late, with 1,512 units underway and more may be on the way. And although vacancy rates for apartments have been rising, demand and lease-up for new properties remains quite positive. Much of the area’s appeal has derived from its improved walkability. Downtown St. Petersburg has actively transformed into a true live/work/play environment, something of a rarity in Central Florida. A prime example is the Edge District, a seven-block area just north of Tropicana Field, which is also home to the area’s most recently-completed multifamily project, the 218-unit 930 Central Flats. The Edge District is centrally-located in relatively close proximity to the downtown office employment node and the neighborhood’s retail area, including the recently-constructed Publix. Additionally, the Edge District is home to numerous bars and a popular local brewery, Green Bench Brewing, and is a hot spot among foodies due to the eclectic mix of restaurants. Despite the neighborhood’s popularity, the hefty apartment construction has begun weighing on fundamentals. Since 2015, overall vacancy rates have nearly doubled, primarily centered in luxury units, where nearly all recent construction has been concentrated. With a 12.8 percent vacancy rate, downtown St. Petersburg now claims the second-highest vacancy of all nearby submarkets. In the Tampa metropolitan area, downtown St. Petersburg trails only downtown Tampa in terms of multifamily construction, with 1,580 units underway. 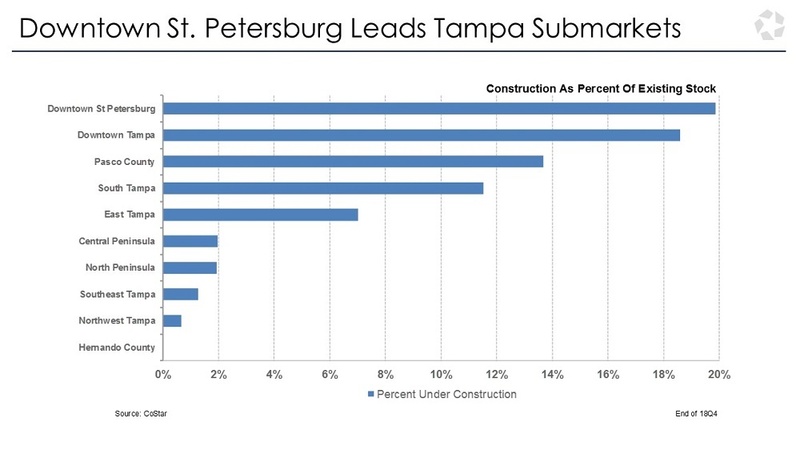 However, when the new construction is measured as a percent of the overall inventory, downtown St. Petersburg’s 19.9 percent under construction is handily the most of all Tampa neighborhoods. Factoring in the loosening fundamentals and ongoing construction, the outlook for the near term is for vacancy rates to rise in 2019 and 2020 as the large number of new units are completed. The big question facing the market is whether the unprecedented demand from renters will continue. The St. Petersburg apartment market has maintained 10 consecutive quarters of positive net absorption. Additionally, even with the unprecedented levels of new supply, annual rent growth remains high at 3.8 percent — more than twice downtown St. Petersburg’s long-term historical trend and among the Tampa region’s leaders for rent growth. The ability of landlords to keep pushing rents aggressively amid record-setting construction is indicative of the neighborhood’s overall appeal.